ETC is a life coaching company that helps empower people to choose the life they want to live. ETC understands that life throws situations at you that are unplanned, unexpected and shocking. It also understands that these events change the landscape of your life and that too is confusing. ETC is here to give you the space to absorb these changes in life, to look at the life paths that are now there because of them, to consider new options and then to choose a new way forward that is positive and life affirming. ETC is here to empower people on their own path back to a new normal. My greatest qualification is my own experience and personal survival. I can offer you insight and understanding to help you find what is right for your life. My husband, Simon Turner, was killed in the World Trade Centre on 11th September 2001 and I was left a pregnant widow at the age of 33 years old. 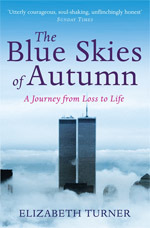 My memoir The Blue Skies of Autumn describes how I hit rock bottom before rebuilding life again for me and my young son William.